Interestingly, it's rare that I get a request for a desert location for a photo shoot. Many (many) times, my clients are looking for a backdrop that is NOT "deserty or Arizona-ish" (in their words). As you can very well imagine, it's tough to find those highly sought after "non-Arizona" looking locations. The lush green fields of tall grass, willowy trees and wildflowers are often hard to come by here in the desert (albeit NOT out of the question, just takes a little wanderlust). So imagine my thrill and surprise when this picture perfect family actually requested a desert scene with mountains. 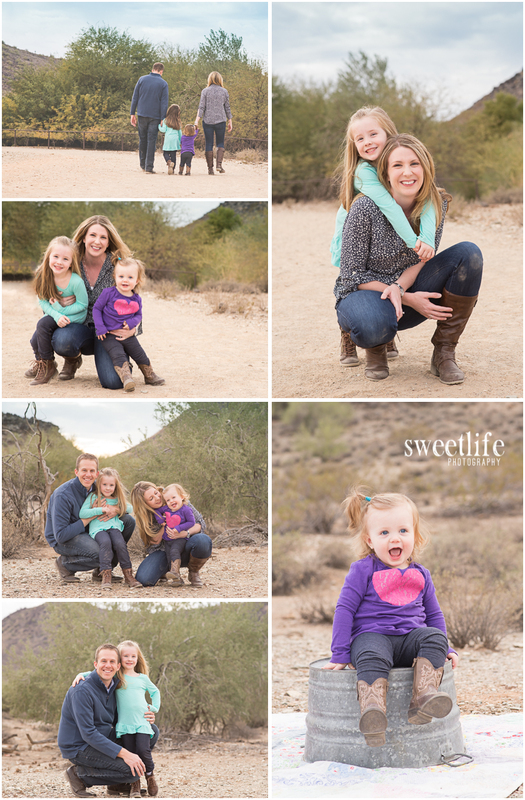 Obviously, as Phoenicians, we don't run short on desert or mountains for that matter, but not all desert scenes are ideal for a family photo shoot. I took into consider the age of the kiddos (1 year and 4 years in this case) and I try to always stay mindful of the drive I'm asking my clients to make as well. Besides, the location only plays a tiny part in the story of beautiful images. It's the humans in the shot that make it beautiful. Wouldn't you agree? ?